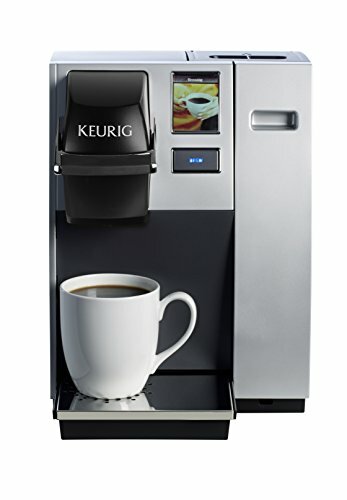 Designed for small to medium sized businesses, and durably built to perform day in and day out, the K150 Commercial Coffee Maker delivers beverages everyone will love. TOUCH SCREEN INTERFACE: Full color touch-screen with adjustable brew temperature, programmable Auto On/Off settings, and you can walk through brewing instructions in three different languages. FIVE BREW SIZES: Choose from five different brew sizes - 4 oz., 6 oz., 8 oz., 10 oz., or 12 oz. From strong to milder brewed beverages. Because tastes differ. REMOVABLE DRIP TRAY: The Drip Tray is designed for easy cleanup and versatility. It slides out of the way to accommodate travel mugs. Plus, it's dishwasher safe. NSF CERTIFIED: Rugged and sanitary; this brewer has passed extensive testing and analysis of the National Sanitation Foundation. If you have any questions about this product by Keurig, contact us by completing and submitting the form below. If you are looking for a specif part number, please include it with your message.